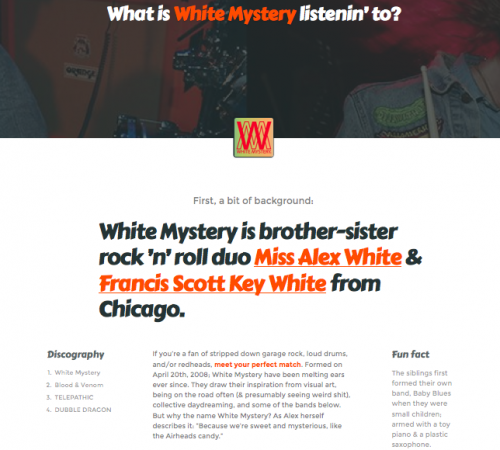 White Mystery is brother-sister rock ’n’ roll duo Miss Alex White & Francis Scott Key White from Chicago. She also likens their music to a Chicago-style hot dog; because “the magic is between the buns.” Some of her musical influences are The MC5, Marc Bolan of T.Rex, Tina Turner, and Poison Ivy of the Cramps. White Mystery has toured worldwide, and earned rave reviews from MTV, VICE, Sound Opinions, Pitchfork – and currently represent the Levi’s #equipped campaign. Their fourth full-length DUBBLE DRAGON is available on double vinyl and iTunes now. Want to stay up to date with them? You can find them on Facebook, on Bandcamp, on Twitter, on Instagram, or on their website. Now, onto the good stuff! The siblings first formed their own band, Baby Blues when they were small children; armed with a toy piano & a plastic saxophone. This is a collection of ten songs that unite glitter and gusto. Starting with the vintage originals, like T. Rex and Sweet, to modern day rock ’n’ roll aliens, like Sam Flax and The Dandy Warhols, this playlist include tracks for White Mystery’s performance opening the David Bowie exhibit on Tuesday, September 23, 2014 at the Museum of Contemporary Art. CLICK HERE FOR THE MIX!